The New York Times calls Joe Camp “a master storyteller.” When he gets passionate about something it always winds up being woven into an engaging story so you will devour every essence and read it over and over again. 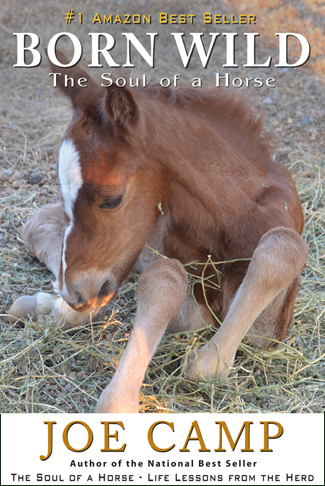 He believes that horses love the opportunity to grow with you, and have fun with you… to learn new things and be rewarded in a positive way that they truly enjoy. 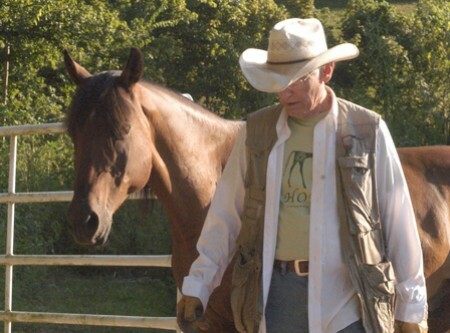 Joe’s words: I believe if you say to your horse: “Do something I like and I’ll do something you like” you will find that they will become the most willing of partners. I also believe that they love being able to speak to you, to initiate conversation. Like Cash does when he walks up and offers his big toothy smile, saying, Might I have a treat please? 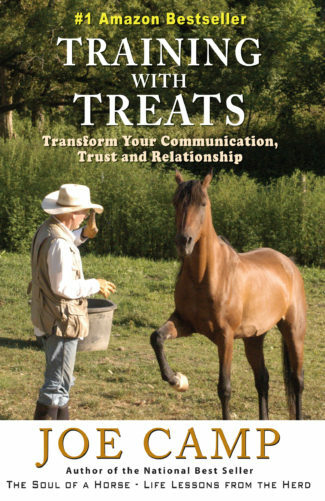 Many trainers dislike the use of treats for training. 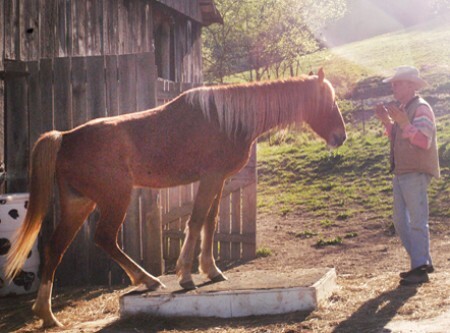 Some even say we shouldn’t talk to our horses. 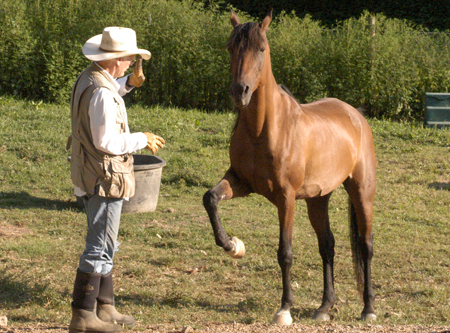 Training should all be based upon body language, just as the horses use with each other in the herd. 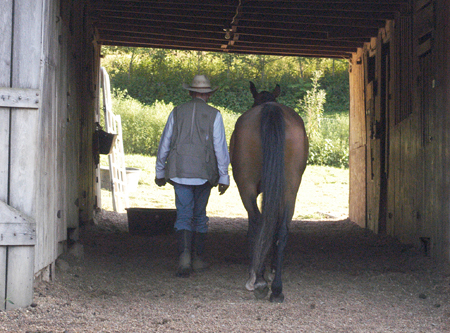 We believe that the horse’s language is important because once the horse understands that you know his language, once you have given him the choice of trusting you, of being in relationship with you, and once you have proven your leadership to the horse then he has a clear capability to grow and understand our language. To learn things he might not have ever had the chance to learn if he had remained in a herd somewhere. Sort of like you grew when you went off to school. 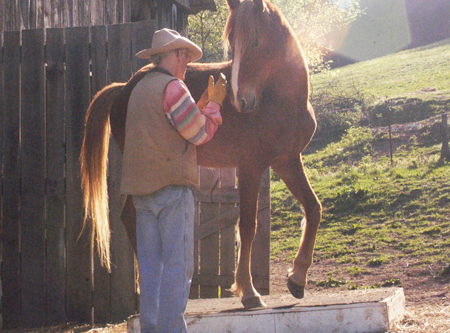 Teaching your horse that you understand his herd language is a must in the beginning. But we now know that communication increases exponentially, both in comprehension and speed of learning, when treats are strategically used. I suppose it comes from so many years working with Benji before horses, and finally drawing the conclusion that whatever a dog can learn, a horse can learn as well because, with treats, they both want to learn.. And the horse will be just as happy about showing off as Benji is. Believe it or not, now all backed up by a new scientific study. 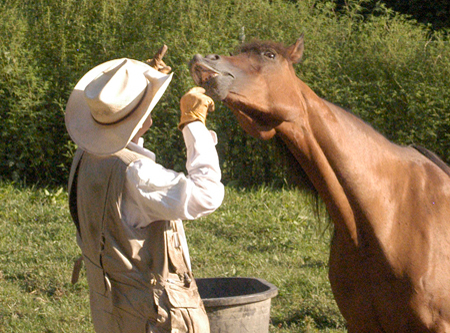 Now our horses have a way to speak to us, to initiate conversation. They stroll up and offer up a big wide smile, or a soft little kiss. And we realized that everything had changed. With traditional training, we humans are always the ones doing the talking. 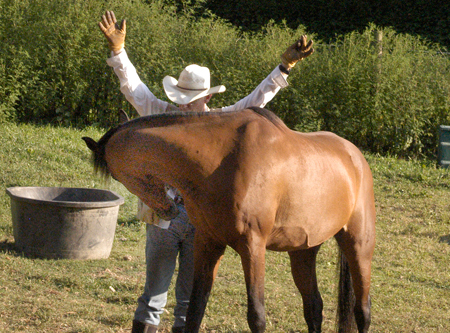 Telling the horse, one way or another, to do this or do that. Never do we ask or listen to what the horse might want. And for the most part we teach with negative reinforcement. Release of pressure. In other words we stop doing something that is uncomfortable for the horse when he does something we’d like him to do. And we call it a reward. Come with us as we step outside the box and discover how to give our horses a new and exciting way to learn, and communicate with us… and have fun! 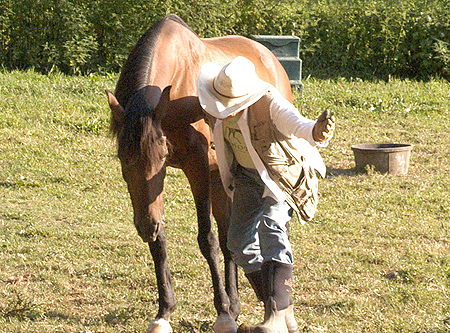 Fun is a key word here because once basic natural training – what I call leadership training – of a horse has begun in earnest, after the horse has been given the choice of whether or not to trust us, to be in relationship with us, the work is all about maintaining leadership and relationship. And learning to communicate what we’d like the horse to do. 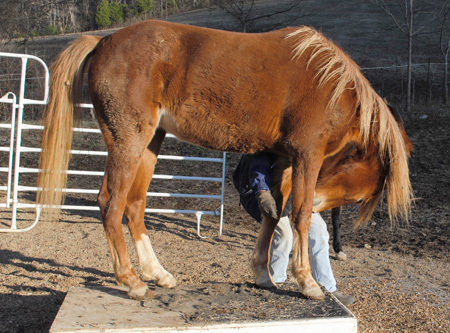 So much typical training is based on the horse’s genetic desire to be safe and comfortable that the usual learning process is heavily slanted toward giving the horse the choice of either doing the behavior or being uncomfortable. Like the simple request asking the horse to lower his head. It’s either lower it, or feel the discomfort of halter pressure on top of your head. 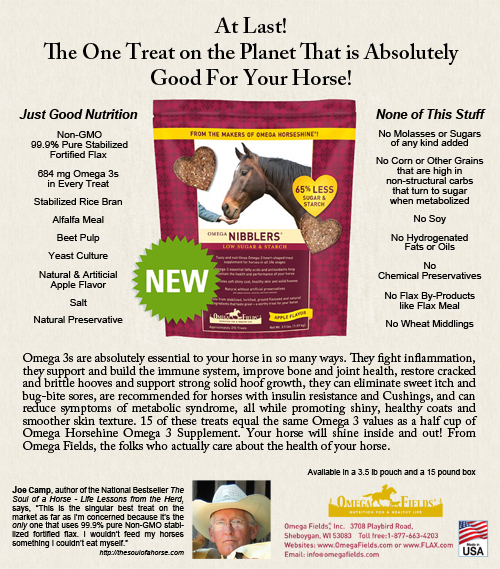 Side note: we use Omega Fields’ Omega Nibblers Low Sugar & Starch treats, the only treat I’ve found that is actually good for my horse. They are great tasting and a functional source of plant derived Omega 3 with the best ratios of natural Omega 9 and Omega 6, made from 99.9% pure Non-GMO stabilized fortified ground flaxseed and natural ingredients. That’s .9% higher than required for human food grade. Nobody else does this. And there’s no sugar or molasses, no corn or other grains that turn to sugar immediately upon entering the body, and no soy or hydrogenated fats or oils. With an extremely low NSC of 14.1. This is an amazing treat! Omega Fields recommends 15 treats a day as an Omega 3 supplement so I never feel guilty or worried about over-training. And all so much fun for both of us. With this book we share it all with you. With free Kindle apps, download this book to your computer, iPhone, Android, Blackberry, iPad, Kindle, or all of the above for one teeny little price! The stories you love and the information you need will always be with you. 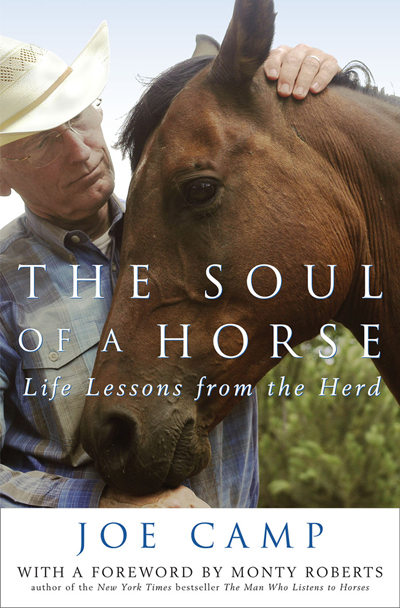 The relationship that changed the world for horses. Please list the names for each inscription in the “instructions to Seller” field as you check out.